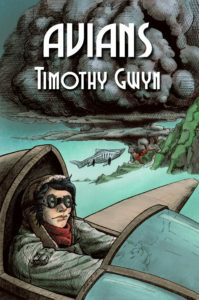 Timothy Gwyn’s fascinating YA novel, Avians, is now available in audiobook through Audible, Amazon and iTunes. This is a remarkable story, with strong female characters, and precise aviation detail. If you haven’t either read or listened to Avians, you should, because this is simply one of the best YA novels out there. The world Timothy Gwyn has created is original and fascinating, one where civilization is restricted to flight for trade and transport, with an apartheid society segregated through genetic modification. Girls are the preferred choice for hang glider transports, enduring privation and brutal training in order to keep their civilization operating. Enter into this world Raisa, who is fourteen. Born to a line of powerful silk merchants, her rebellion against an arranged marriage is doomed. The Avians are her only alternative. The audiobook production is by Grace Hood who has done a stellar job of bringing life to Timothy’s characters. Whether you enjoy reading in print, ebook or audiobook, you’re going to get lost in this fascinating story.